All transactions are safe and secure with a reliable history in online purchasing behind each of our associates. 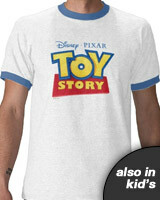 Buy the Toy Story Logo t-shirt to own Toy Story clothing and merchandise. This Toy Story tee pays homage to the movie that features cowboy Woody and his pal space ranger Buzz Lightyear. They spend their time hanging out with characters like Woody's horse Bullseye, piggy bank Hamm and dinosaur Rex. Lucky for them, some quick maneuvering always seems to land the toys back in the hands of their loving owner Andy unharmed. Somehow these two toys always come out on top. Any of the Toy Story t-shirts are sure to lighten your spirits. Also, be sure to check out the Toy Story toys, action figures, dolls and movies. In addition to the Toy Story Logo tee above, browse the Toy Story Clothing Gallery for more apparel like men's and women's clothes, kids shirts or hoodies.